OUR CHARTER: To protect and enhance biodiversity and carrying capacity, and to create a means of sharing an appreciation for and a sense of belonging to Nature. In fall of 2016 and spring 2017 we completed our fourth round of “river work”. We have now stabilized streambank and enhanced habitat on nearly half of the mile of the West Fork that runs through our property. Visitors will see some areas that look like they were recently disturbed. Rather quickly, though, these areas have become less visible because they were planted with native forbs, grasses and sedges early in the spring of 2017. For the next year or two, we will still be mowing these areas and rogueing unwanted volunteers. Human agricultural activity over the last century caused the washing of soil from the surrounding ridges and hillsides into the river valleys. (These erosion-caused deposits are 4 to 8 feet deep along our stretch of the West Fork.) Stream flow throughout the Driftless cuts deeply into these deposits leaving high and continuously-slumping dirt banks that won’t support vegetation. 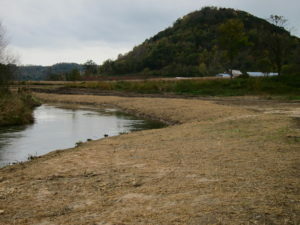 High water events move these often nutrient-rich bank soils into streams leading to degradation of fish and other aquatic habitats. When these soils contain phosphorous and nitrogen and end up in our surface waters, the result is low oxygen levels and algae blooms that can actually kill fish and other animals. Eroded soil rich in ag nutrients is the reason we have the hypoxic “dead zone” in the Gulf of Mexico. Closer to home, this is why surface water lakes turn an eerie blue-green and become unsafe for human and animal contact. Streambank improvement work seeks to stabilize banks by shaping them to more gradual slopes and planting them with perennial vegetation. Oftentimes, the erosion-prone banks are protected with rock to “armor” them against high water events. Sometimes shaping alone is done. Logs, large in-stream boulders and fish habitat structures called “lunkers” are installed in the stream to provide places for trout to feed and turtles to bask. 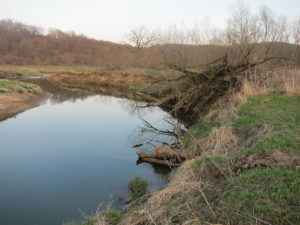 Shaped banks planted with perennial vegetation allow high water to escape the high-velocity main channel and slow down. This slower water releases some of its sediment load and reduced water velocity lessens the stress on downstream banks. These are modest efforts to reconnect the channel with its flood plain and to restore stream physical structure to something like its natural state. However, because we have so much former ridge-top soil in our valleys, it is nearly impossible to get things back to the way they once were. There are several stretches along Nature Nooks’ piece of the West Fork where you can see, as you kayak or walk, stream restoration work that has been done in four different projects since 2003. The most recent work is a 780 foot section right out in front of our house. Much of this used to be a 5 to 7 foot high, non-vegetated, slumping mud bank. We calculated a realistic estimate of the rate of recession (bank cut depth X length X height) and found that just this 250 feet of bank has been contributing 35 tons of sediment to the stream system per year! Knowing this and looking at these raw banks every day from the house, we just had to do something about it. The restoration work plan is usually designed and approved by staff from the Natural Resource Conservation Service, and sometimes through cooperation with County Land and Water. DNR permits are required. There may be conservation cost-sharing money available through one of several different programs. If a situation demonstrates a high enough conservation need – is bad enough – one can get approximately 70% of costs covered. Heavy equipment is brought in to move soil, shape the bank, add rock and replace the soil. The bank must then be sown with perennial grasses. For us, this means native short grasses and sedges which will require mowing and rogueing unwanted invasive plants in the first two or three years. Banks were pulled back with an excavator to a 3:1 ratio (sloped 3 feet back for every 1 foot of elevation gain) on 500 feet of the river. 180 feet with the least amount of erosive water pressure was shaped only and no rock was added. The remaining 320 feet were also shaped at a 3:1 but rock was also added to the “foot” (3 feet into the water and on a flattened bench with rock placed up to 1.5 feet above normal high water) because erosive pressure was judged to be greater here than in the shaped only section. Then, on the steepest and most curved portion mentioned above that really gets hammered in high water events, rock was put in place at a 2:1 ratio. The more gradual slopes at 3:1 are what we prefer as this seems more natural and allows both animals and humans easier access to the river. When rock is used though, the 3:1 ratio adds 40% more rock when compared to a 2:1 slope ratio. And, because rock is the biggest cost factor in such streambank stabilization work, one can pay dearly for making streambanks easier for the turtles and other critters to navigate. and to create a means of sharing an appreciation for and a sense of belonging to Nature. Introducing the Nature Nooks Retreat Journal! Yes, you can get a snapshot view of what we are about here at Nature Nooks Retreat from our website, or from our occasional video posts on facebook. But really, we are serious about the Charter that appears at the top of this page, and which will head each entry in this blog, our new journal. While we hope our entries will be entertaining for our visitors – actual, potential and virtual – they will be more in-depth for those who really are interested, and at the same time, they will help us record our progress in being the best stewards to this land that we can be. 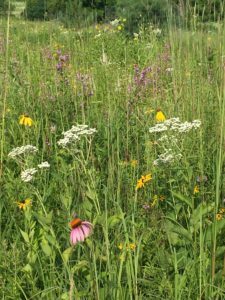 We initiated several projects in the last two years – streambank stabilization, STRIPS for sediment and nutrient trapping, establishment of new prairie and a new constructed open wetland/marsh. Those will be covered in some of the first entries, and then we’ll go back in time, a few years to a few decades. We will definitely spice it up with photos, and we’ll alert fb users to new entries with a link on our facebook page (in case you want to like us). We’ll place a hard copy of each entry in our cabins, so folks who are actually here can connect words on a page to the water, the plant life, and the wildlife. And always, we’ll welcome your comments! 2018 is Year of the Bird – and Birding Tours at Nature Nooks Retreat!